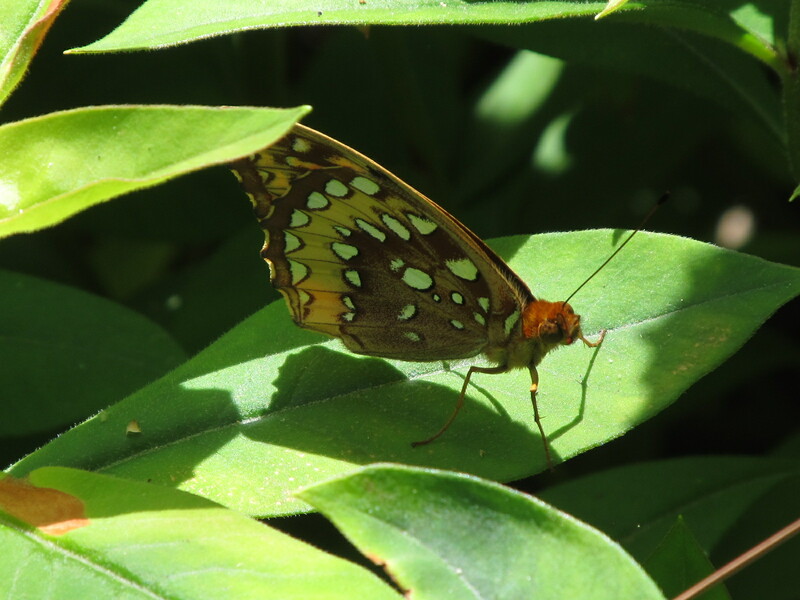 Our butterfly numbers have been low so far this spring. 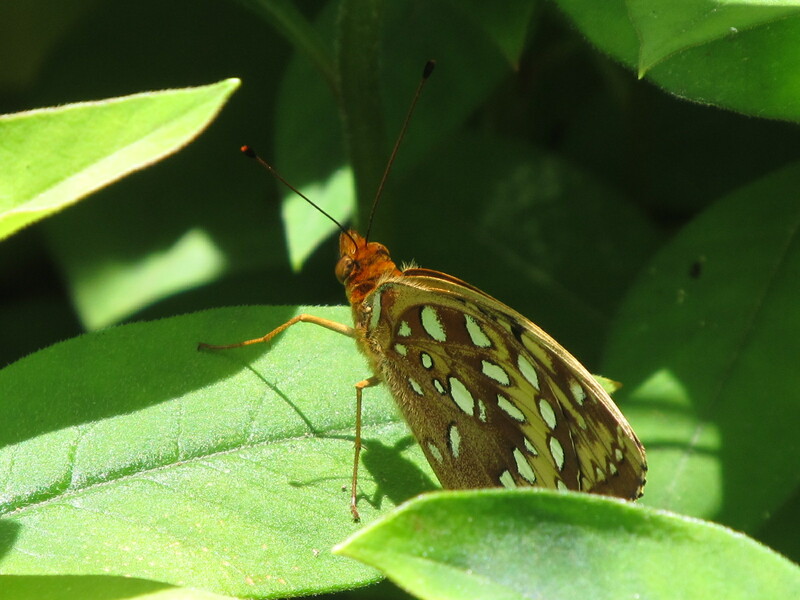 Then, this morning, I found a great-spangled fritillary perched in my butterfly garden . It didn’t mind my attention at all, and posed in poses I could use. 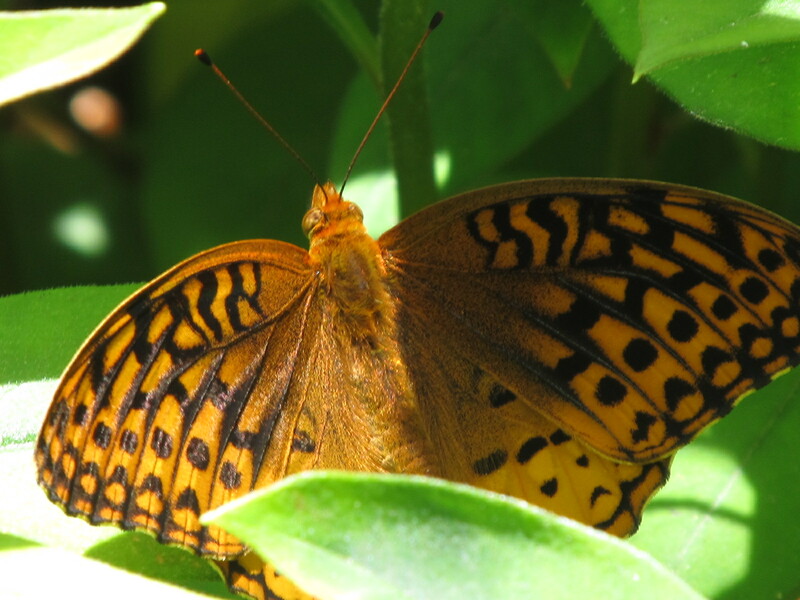 Great spangled fritillary (Speyeria cybele cybele) is a common butterfly in southern Illinois from mid-May through early October. 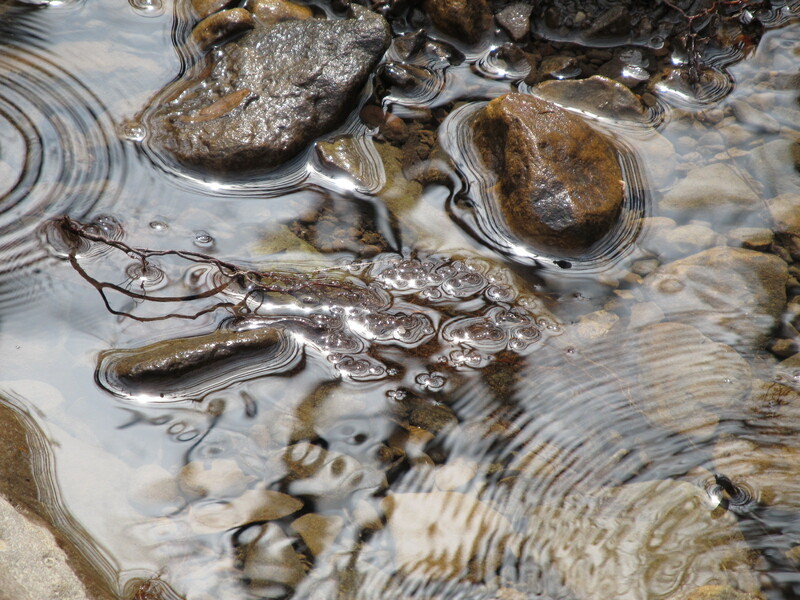 Their wingspan of 2.6 to 3.5 inches makes them easy to spot. 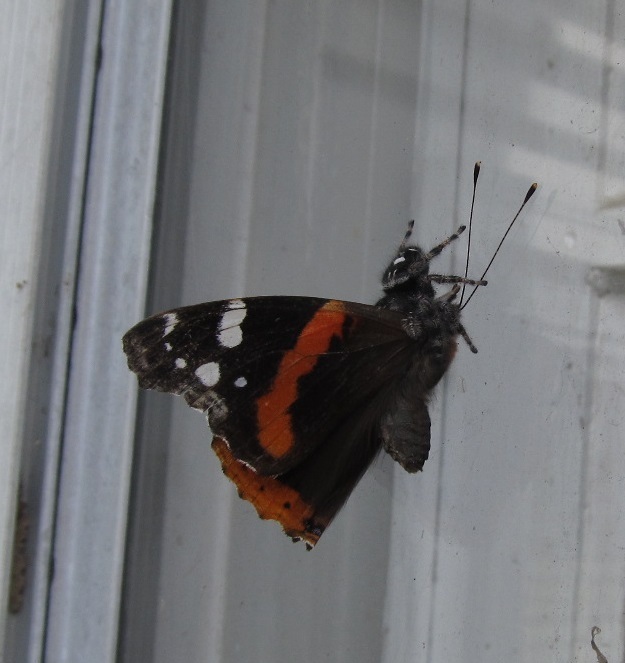 I was in the kitchen cooking supper, when I saw a butterfly out the north window. I grabbed my camera and hurried outside. 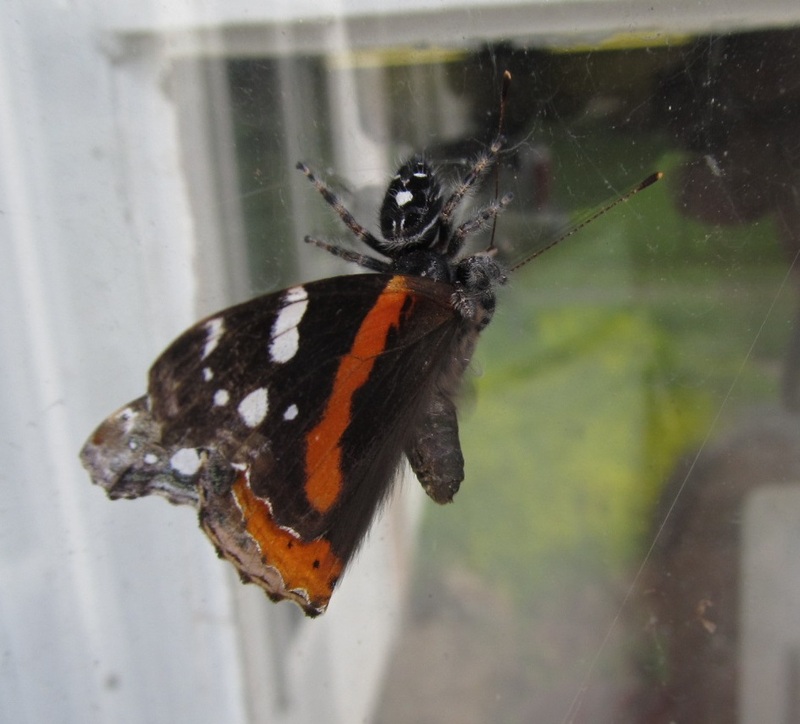 A spider had captured a red admiral butterfly (Vanessa atalanta), and was in the process of getting its dinner ready too. I’m not absolutely positive, but I think it’s a daring jumping spider. 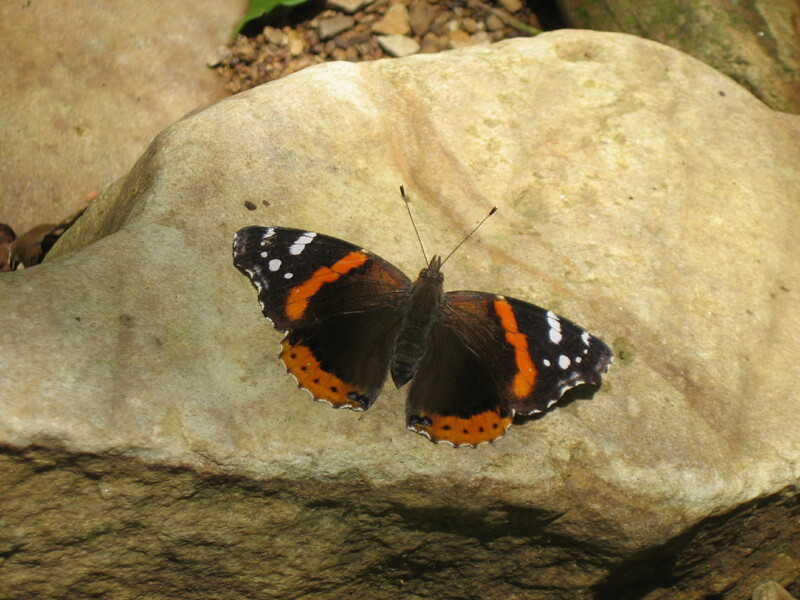 Red admirals (Vanessa atalanta) are a common butterfly. Their range covers all of North America, from central Canada down to Guatemala. 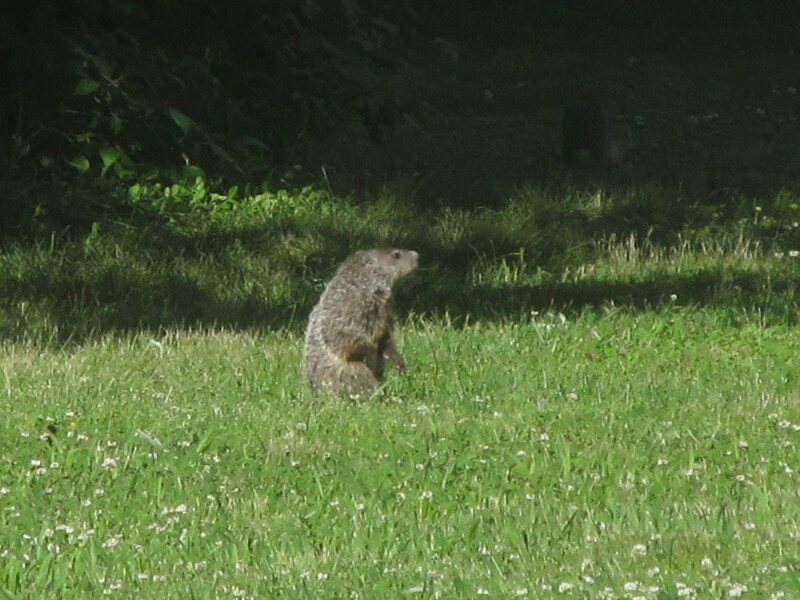 I stood 5 feet away, watching it. 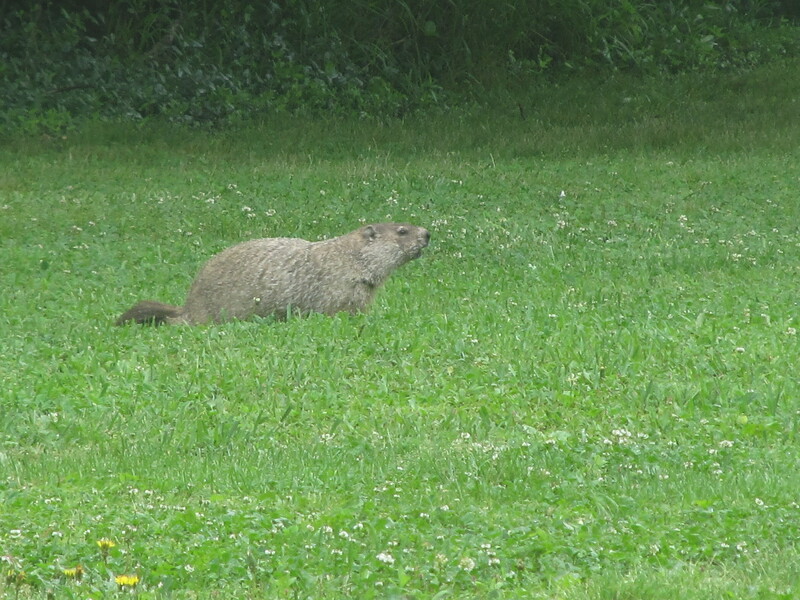 Both of us relaxed with the encounter. The mirror for a spring day. 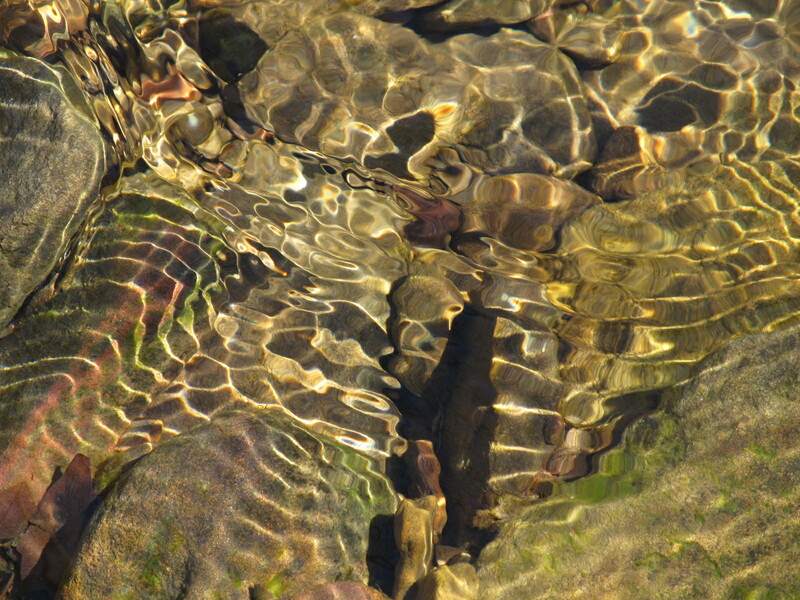 Ripples roll yellow-rimmed shadows, like a spilled bag of marbles. 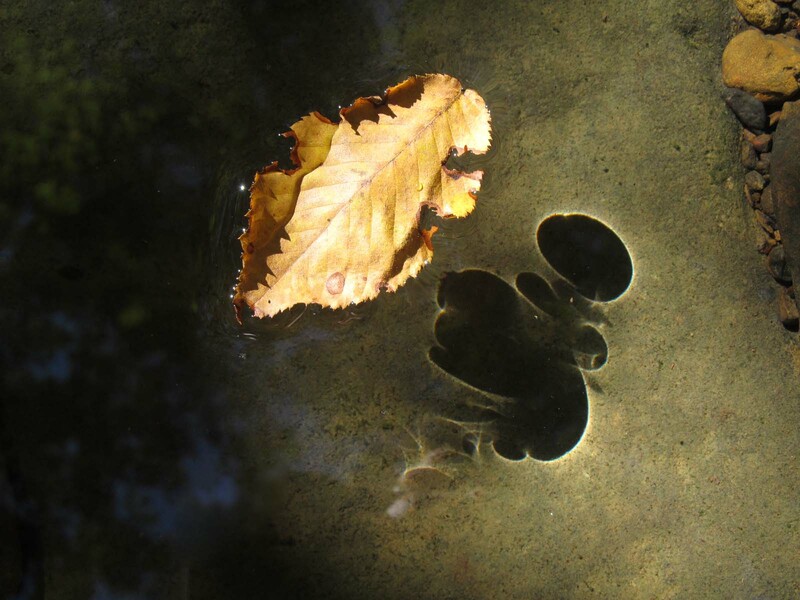 An abstract shadow of the floating leaf. Look close — there’s the yellow-rimmed shadows. 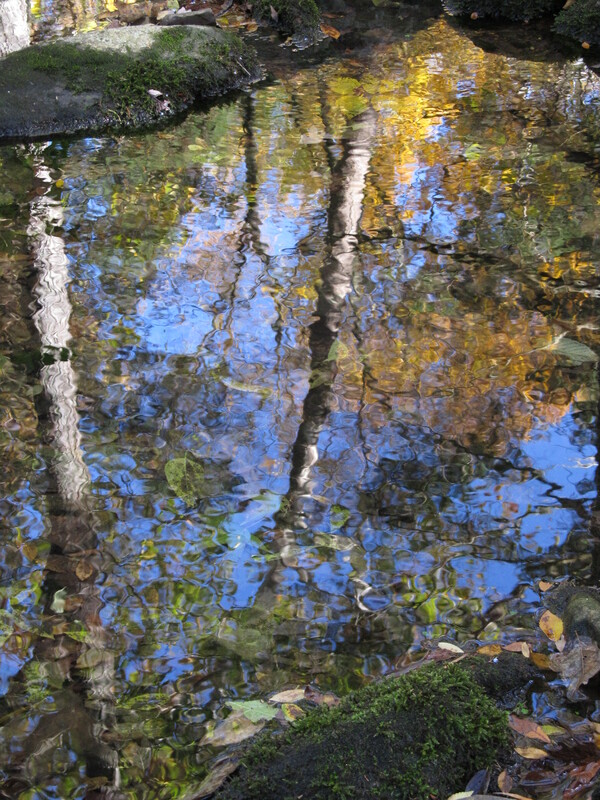 There’s also faint surface reflections of sky and trees near the bank. Sky reflections show water movement and faint designs of nearby objects. 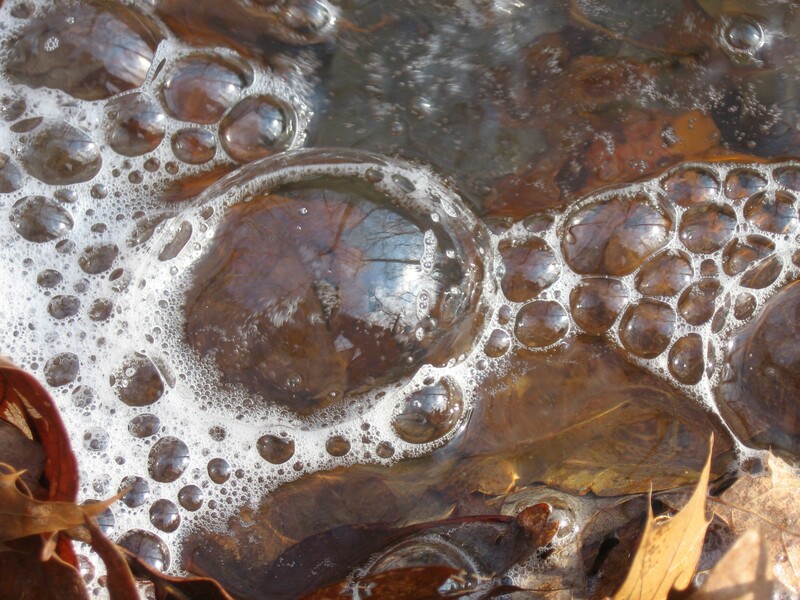 Every tiny bubble reflects the same view of above. 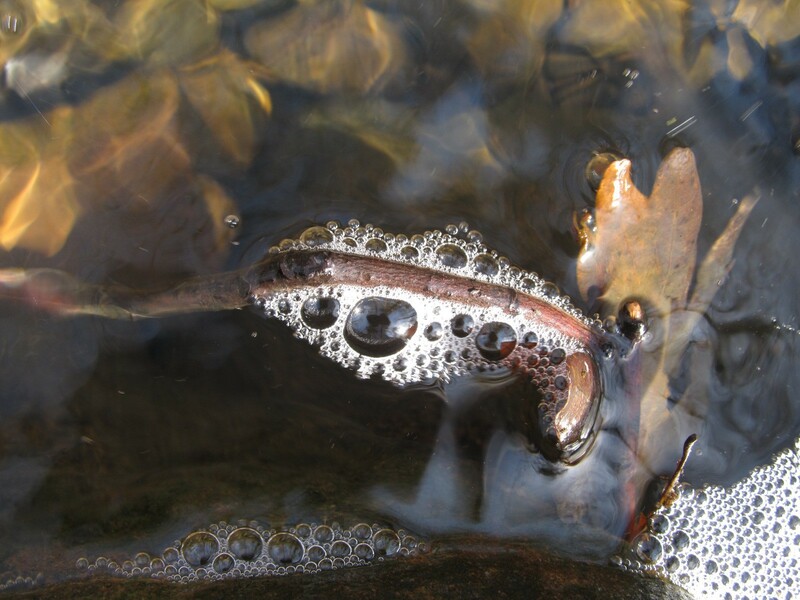 Larger bubbles become a “lens” that distorts the circular view around it. 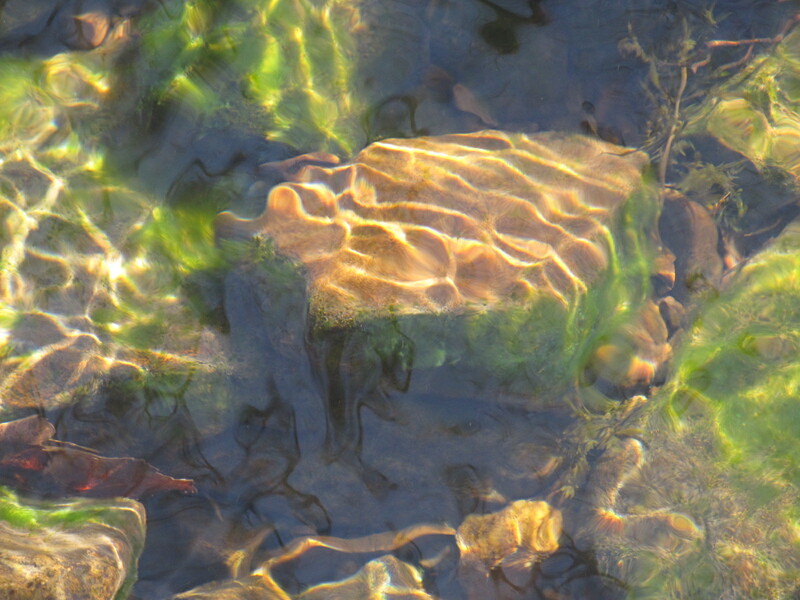 The water’s surface … a Monet painting? 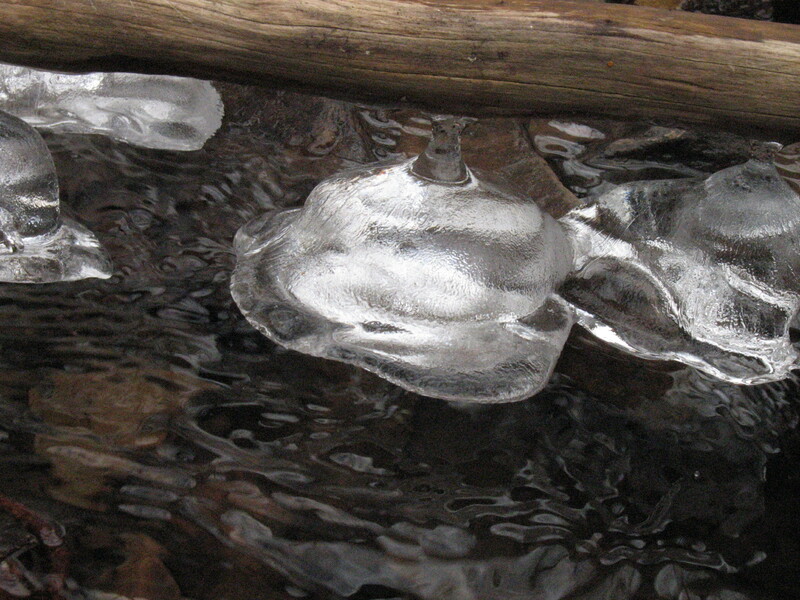 Ice formed into the shape of either a bell or a hat. 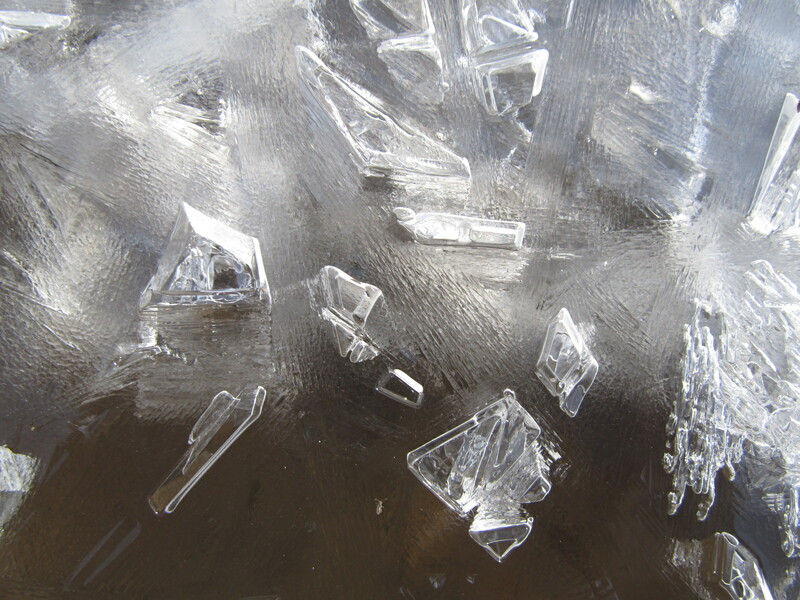 The surface of the water freezes. 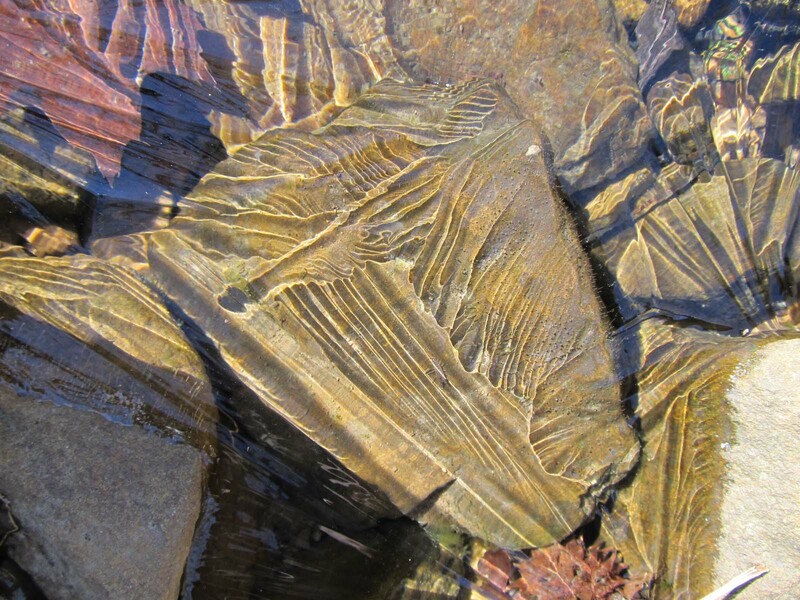 Lines form as the water level gradually drops, and the ice continues to form only where the water touches it. I have no idea how this ice formed. It had to be magic. 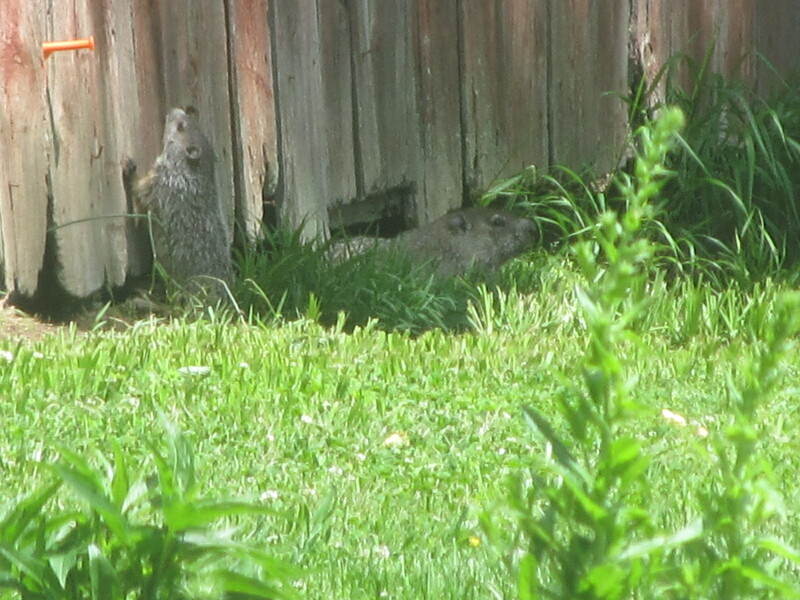 My camera always accompanies me when I’m out in the yard. I had been taking pictures of this and that. 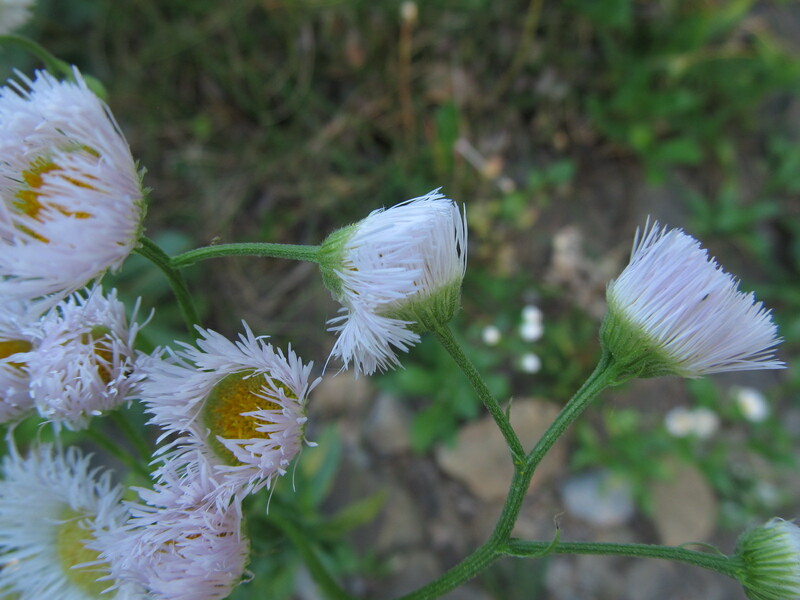 Then I found this daisy fleabane (Erigeron annuus). 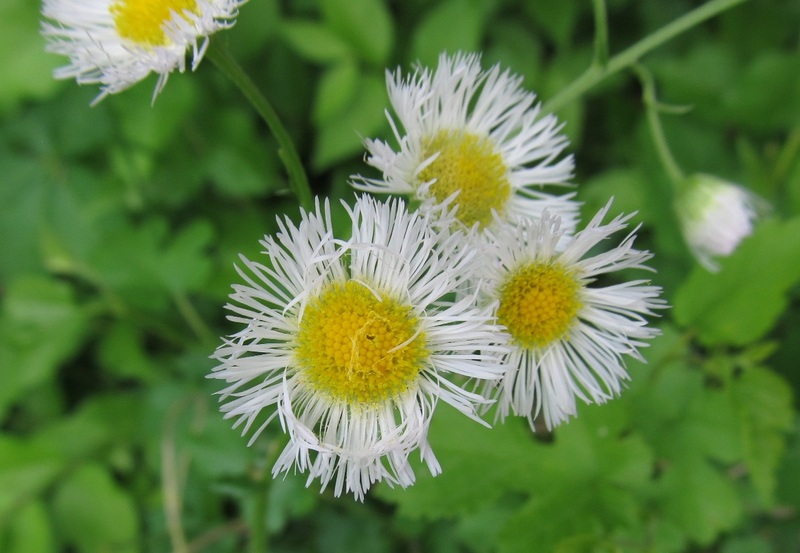 Its lower petals looked like they had been braided into a half circle. The shape was just too deliberate looking to have had happened naturally. 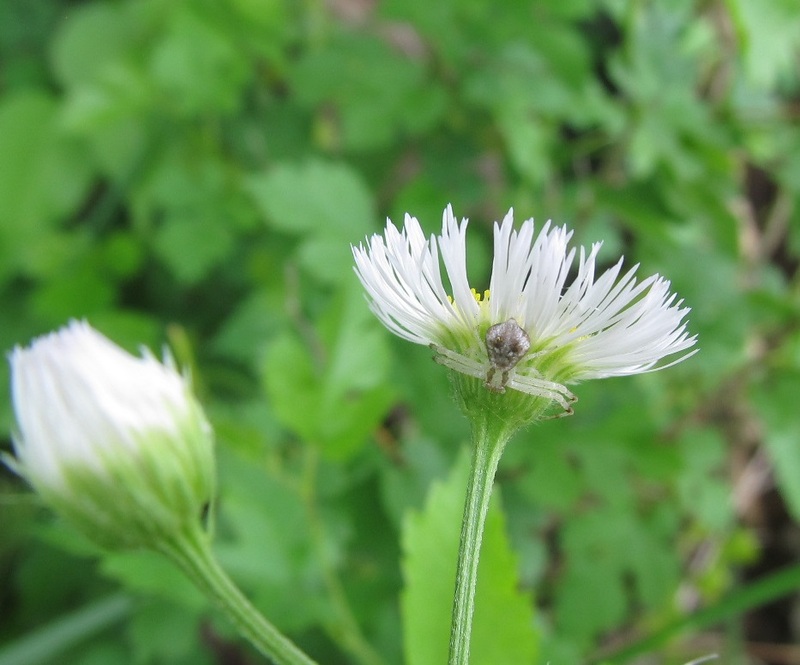 A crab spider was all I found on the small cluster of the flowers. The flowers were past their peak by the next evening. 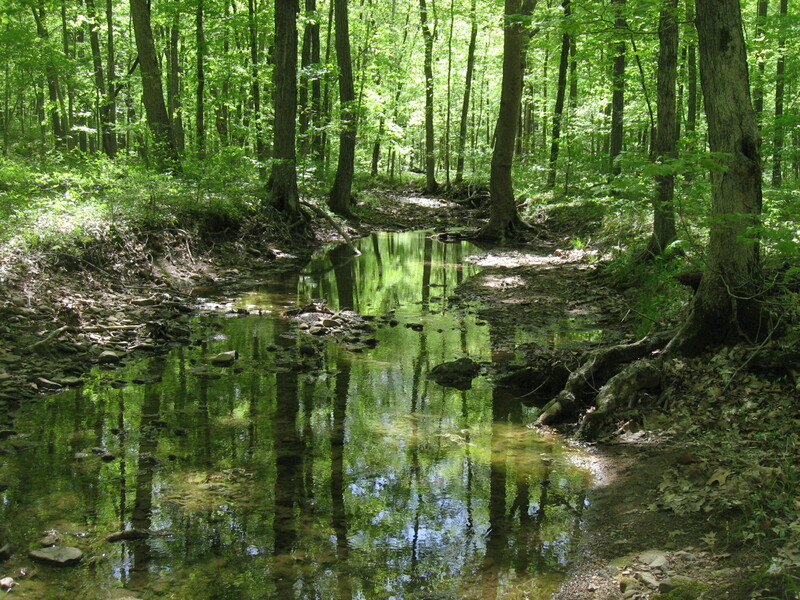 The”braided” area still remained roughly the same. 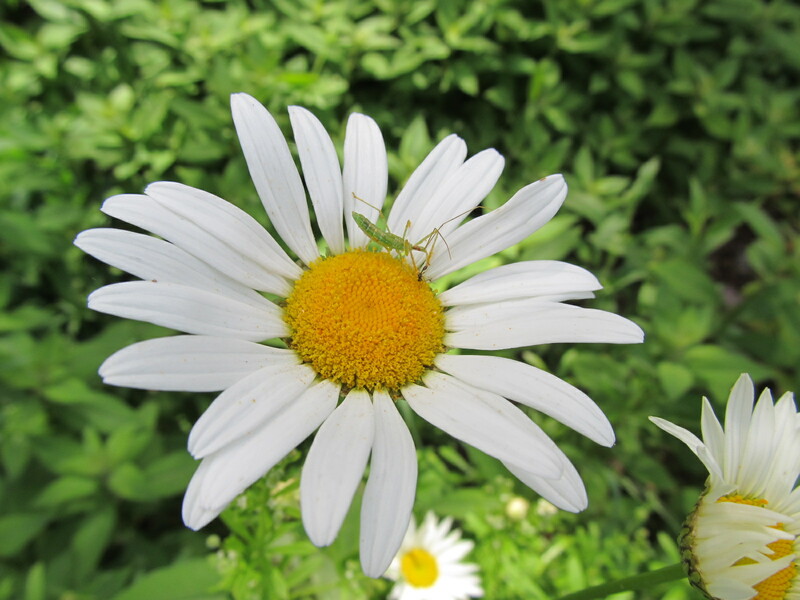 I just noticed another crab spider in the lower flower head on the left. The two flower heads in the center created a cute enclosure … it would be a good place to “camp” or hide from predators if you were a tiny insect or spider. 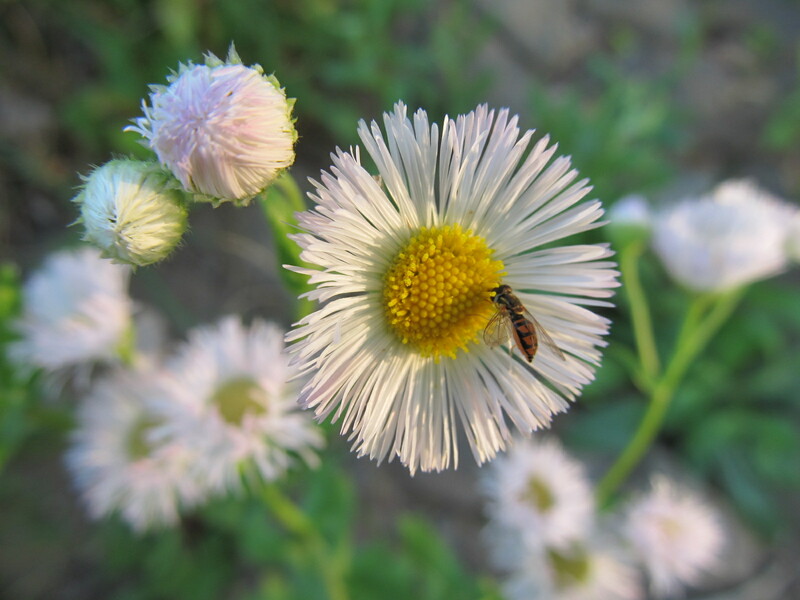 A tiny bee took advantage of the fresh flower head for an evening snack. 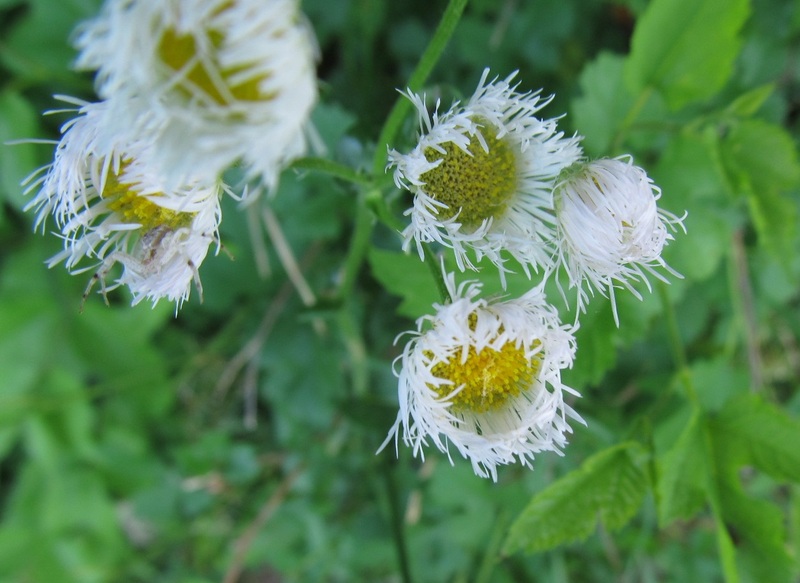 The “braided” petals still remain an unsolved mystery. 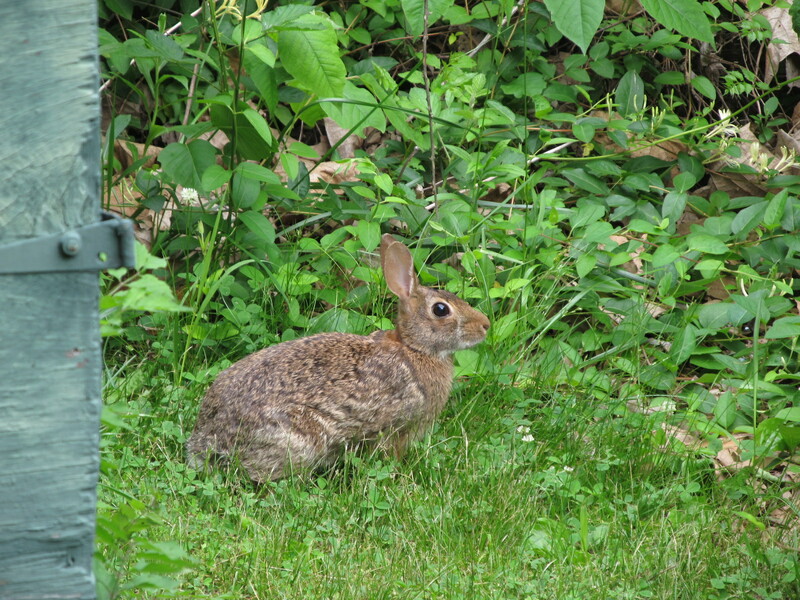 Maybe I’ll learn more with future encounters … which would probably be next year, since the daisy fleabanes are almost done blooming. Please excuse the quality of the pictures. 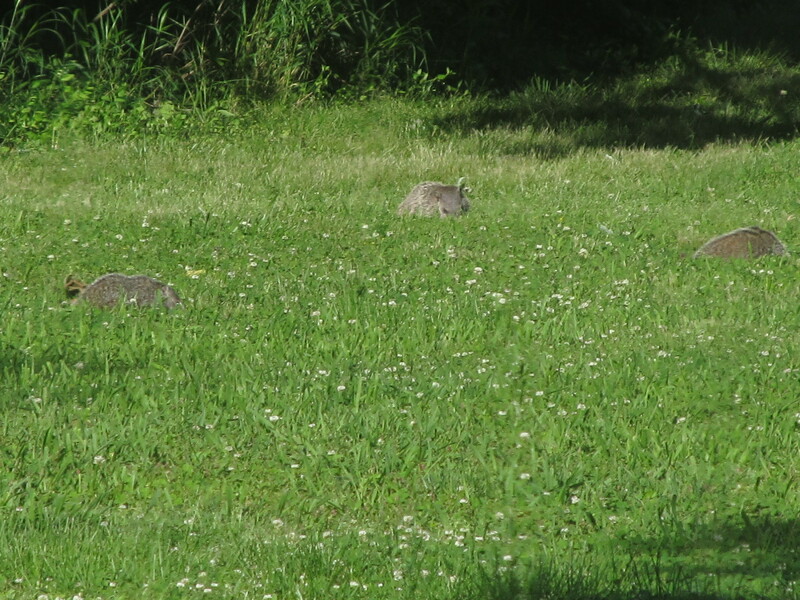 The sun has shifted in the sky, and shadows are different from earlier this spring when the foxes were here. I also have to take the pictures from inside the house. 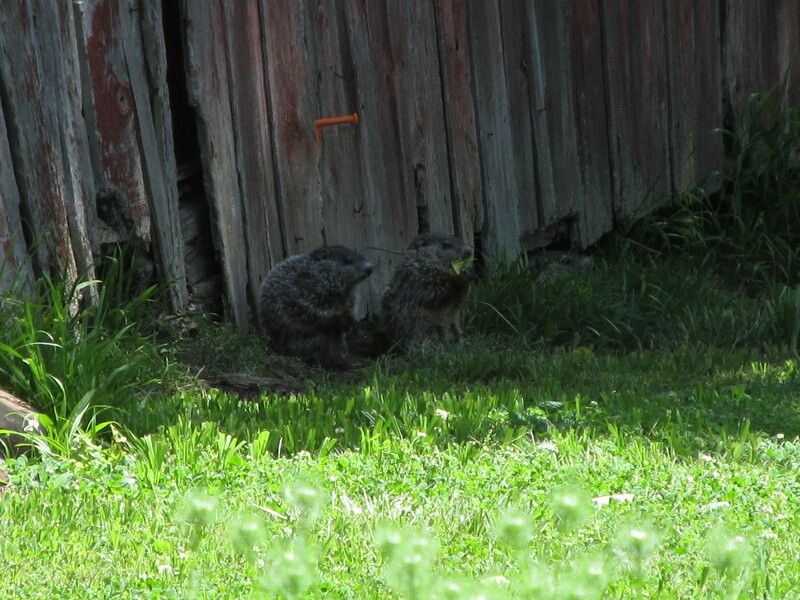 This is the first time we’ve had groundhogs stay under the barn for any length of time. The adults wander farther when feeding. The adults watch for me in the house. I actually have to get my camera, bend over to get myself out into my husband’s workroom. Then I crawl toward the window, and slowly get into a standing position, without being seen. And then I get the camera on the windowsill and start taking pictures. Sometimes, I feel like a nut. 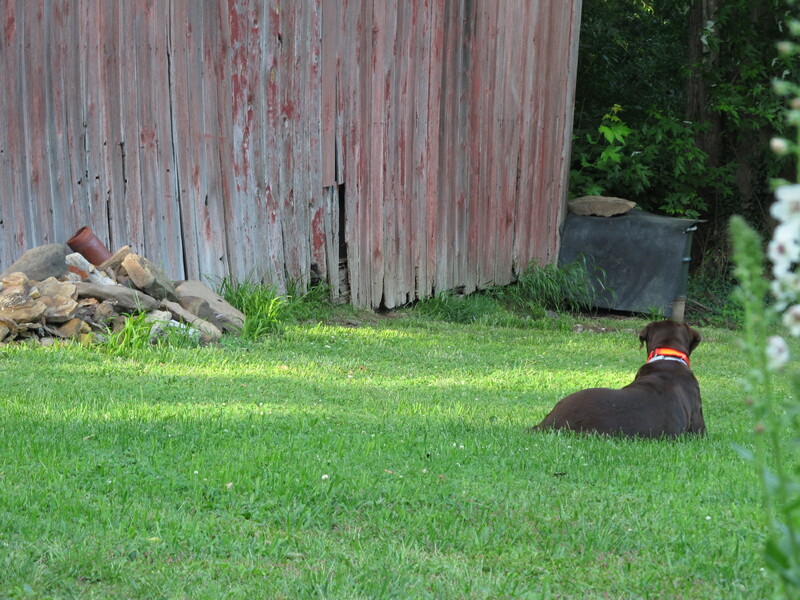 The young stay closer to the barn. 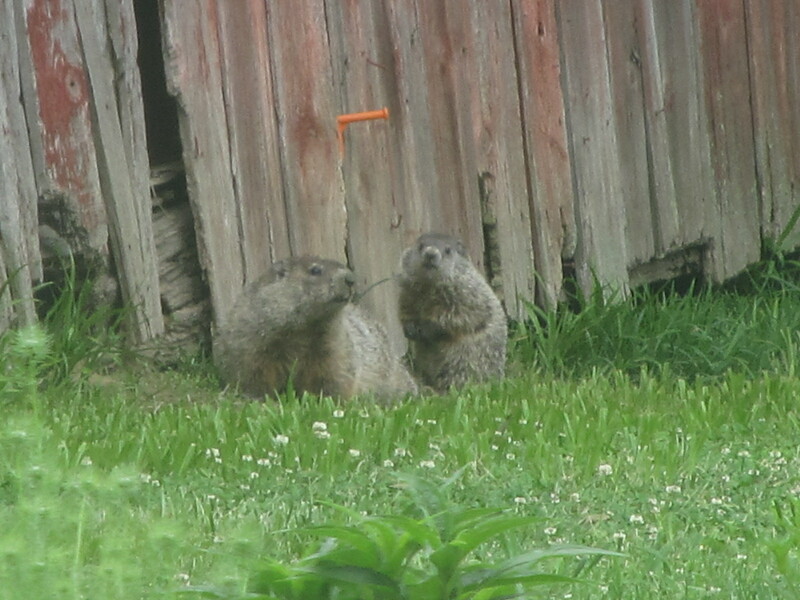 I would like to know what’s being discussed in the conversation over lunch. 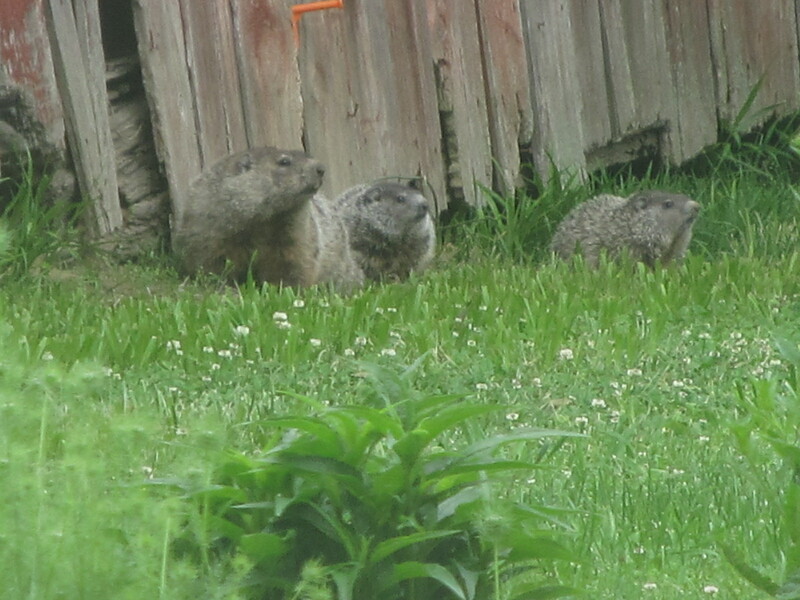 There are four little ones. This picture gives a scale between their size and that of the adults. 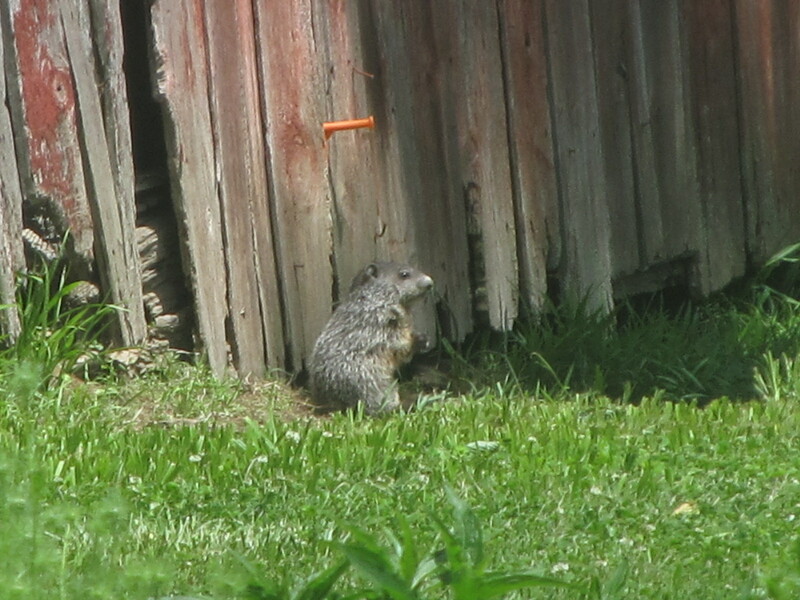 The groundhogs just come out from under the barn and start eating. 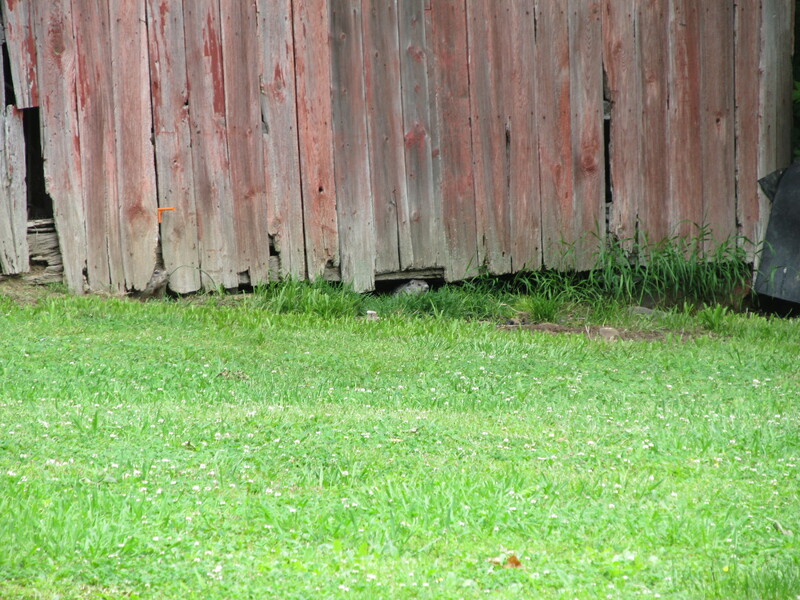 When the foxes were here, the male had to go in search of food often. I wonder what they’re watching? Apparently, I’m interesting to watch too. Apparently, they like it here. 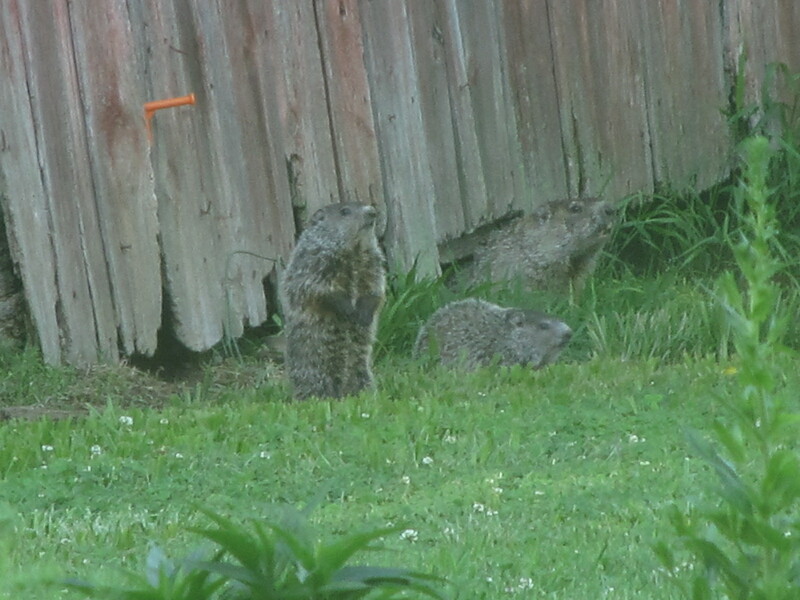 It will be interesting to see how long they stay. I went outside after supper to weed in the flower garden. Buffy went out with me, for an obvious reason. 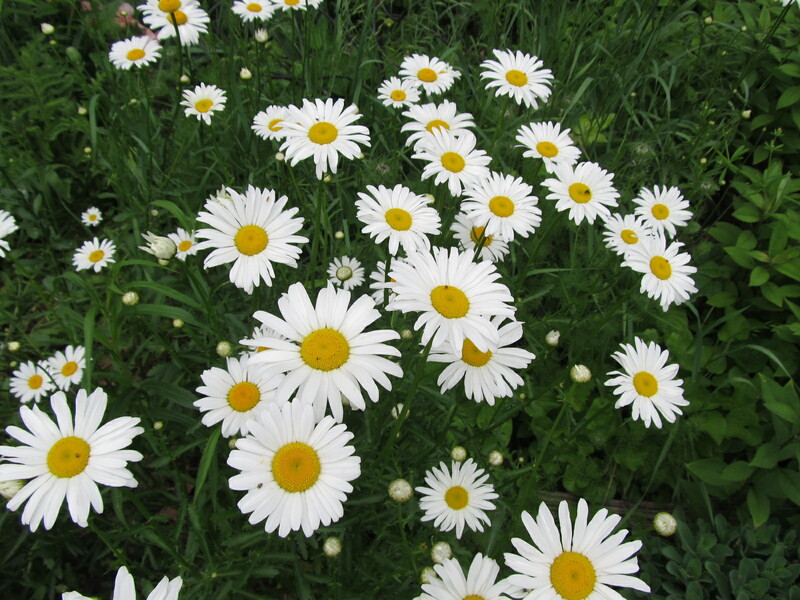 Two clumps shasta daisies (Leucanthemem superbum) grow in my butterfly garden. 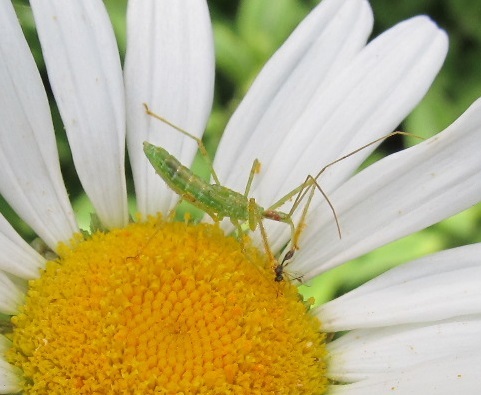 They don’t attract as many insects as they look like they should. 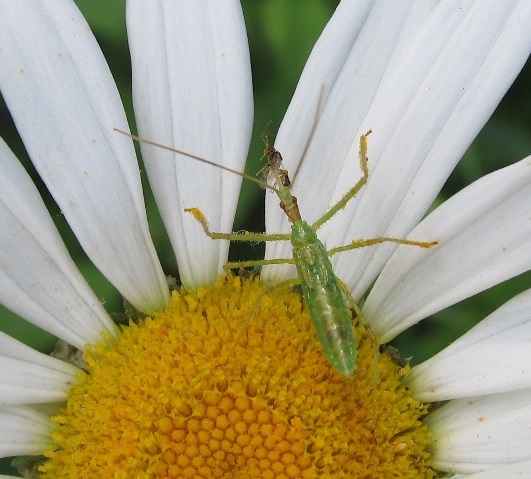 I found a young assassin bug when making my evening rounds of our backyard. It had captured an ant and didn’t like my attention. 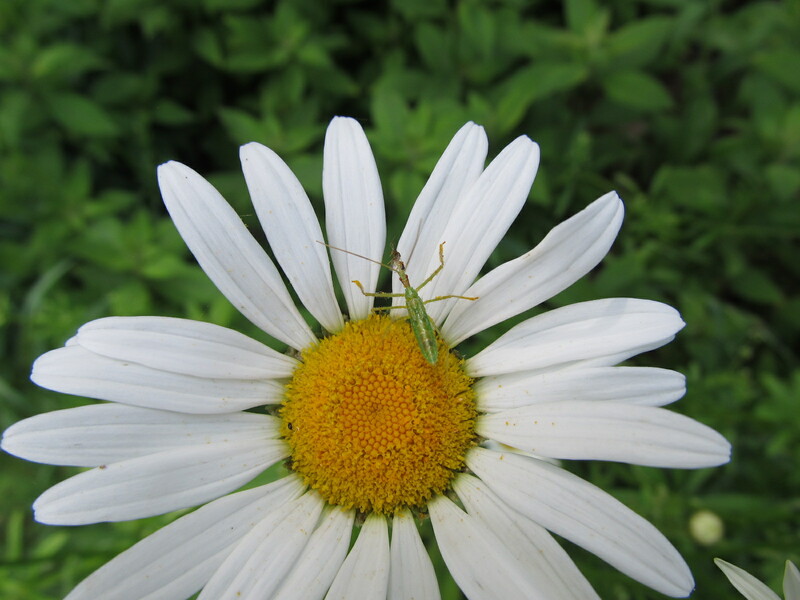 and this time it had a tiny bee.